Its palpable. I can feel the pulse quickening. Legs and hearts and minds starting to come around. Excitement. Hope. Achievement. In deference to age I’m going to kick this Monday off with some superlative masters performances. Waaay back in the day I worked with a young lady named Susan Loken, REAL fast lady. Perusing the Phoenix Marathon and Half Marathon results her name jumped out of the Half list. Now in the 50-54 age group she cranked out a 1:22:39 to win her age group. Local twist is that she is the founder of the Sonoran Distance Project ( my former mate Natalie Como’s current kit). In the full marathon Julie Swanson ran 2:58:22 to capture the masters title. Local turn is 3 time Olympic Trials Marathon qualifier Christy Nielsen took 2nd master in 3:01:49. On the other end of the age spectrum, that little waif out of Michigan. Erin Finn captured an amazing double at the Big12 Indoor Championships. Took titles in the 3000 (9:08.90) and 5000 (15:37.1). Back to the greybeards. The millionth edition of No Frills shook out south of here. A statement of loyalty and maturity, average age of the men’s field Saturday = 43.15. 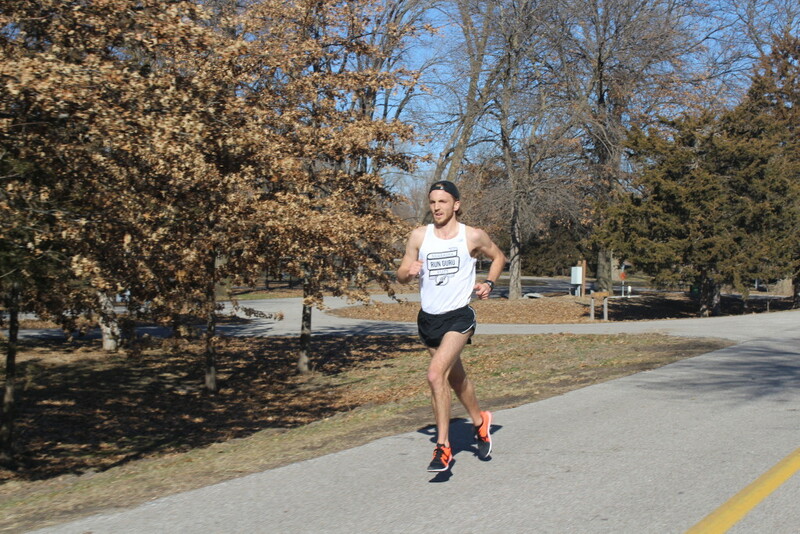 Nathan Swenson (age 28) took the win in 28:48 (5:46 pace). Average age of the women’s field = 38.2. Jen Freeman (34) took the win in 32:03 (6:24 pace). Back to the future. Over the last 20+ years I’ve had the privilege of riding in dozens and dozens of road race press trucks. Watching America’s best. Often battling the best from other countries. So what? So this. Linda and I set up Saturday’s Halley’s Comet 8K race clock in the back of the lead vehicle, for a reason. — Wait, wait, let me preface. I’ve trumpeted loudly our “Will Lindgren’s Festival of Races” courses as being designed exclusively for personal bests and association records.—- Much celebration a couple of weeks ago when a new 5K mark was set, Johnny Rutford’s 15:15. The toast of the LDR community and so very deserved. Johnny and Colin Morrissey and Cory Logsdon (arguably LRC Racing and Team Nebraska’s top runners) get what is going on here. They’ve been out for a couple editions and know the course and its potential. They’re not afraid to get some against each other. Or to lineup against Nebraska Run Guru Elite’s best. Which they did. 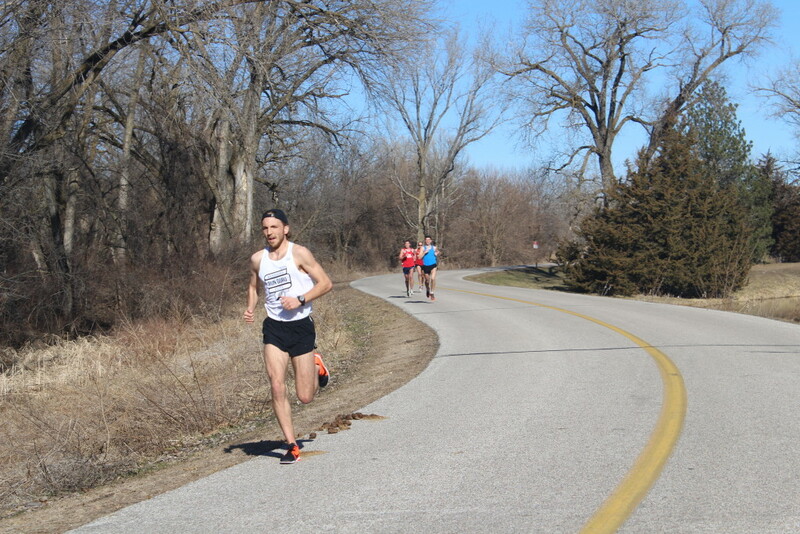 At the finish tape it was Grant Wintheiser in 24:12, the fastest 8K ever contested on Nebraska soil. Like this: 4:51, 9:49, 14:39, 15:06@ 5K (fastest 5K ever contested on Nebraska soil), 19:31 @ 4 Miles, 24:12.81 at 8K. As soon as I posted the results and trumpeted the record the challenges began. Not sure what changed over two weeks but at least we are moving in the RIGHT DIRECTION. -The course isn’t certified! Paperwork was submitted on December 21st, hold your horses, as soon as that was revealed the next challenge came. -The race wasn’t USATF sanctioned! In other words I did not pay the $65 to insure the event, I’m still in the grey area over whether or not it is applicable in this situation, that’ll be decided by the National Office. Pretty obvious why it was not sanctioned. I’ve offered a FREE ENTRY to the entirety of our Nebraska Association membership. For every race in our Two Rivers Winter Fitness Series. And get Cory and Colin and Johnny and that’s it. That is the support in a nutshell. Only the very best bothering. All our efforts to encourage first class competition, this is what we get. Good thing I’m tough. Stay tuned. Back to the back of the truck. 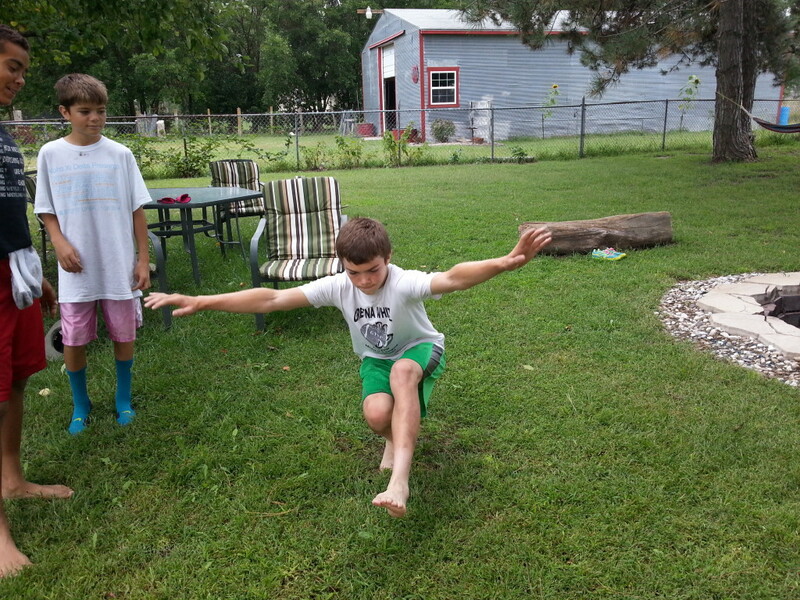 I watched Grant’s style, his form, his power. In the last 20 years as an observer of national/world class racing I have never seen anyone as smooth. In the middle of a 95 mile week. Including two workouts that included 7 X 1 Mile @ 5:05 (3:00 easy between) and 12 X 1K (:30 rest) in 3:00. Starting off quick, the best and bravest of our Nebraska Association club athletes. Colin showed tremendous juevos, step for step with Grant in the first 3/4 mile. Cool pic because the 4 shadows and 3 runners, Cory in the ether slipstream. Foreshadowing the Lincoln Half Marathon. Grant separated shortly after the mile, Johnny never threw in the towel though, impressing the hell out of me. And then there was Grant. Good tough, solo effort for the last 4 miles. I have a feeling this whole state record business means more to me than him. 15:06 and 24:12. Love Me Two Times. This entry was posted in Uncategorized on February 29, 2016 by runguru. This entry was posted in Uncategorized on February 28, 2016 by runguru. Only one other time do I remember waxing political here. Got to say though, last night’s Republican debate, well that was something else. I was tossing about the Atlantic Ocean on the USS Concord when I cast my first vote, 1976. I’m old enough to have seen a lot, but you’ve never really seen it all. What amazes me more than anything this Republican election cycle is the cartoonish, circus like nature of the process. Issue anybody? Somebody? My old buddy Sri, one of the Three Original Upstream Wisemen (West O Tao), insists that 95% of the human population are fools to one degree or another,. How else do you explain Trump atop the heap? I moved to Nebraska 15 years ago, went to the DMV to get my car registered and myself licensed. Part of the application asked whether I was Democrat or Republican. A or B. Which is it boy? What’ll it be? You Red? You Blue? Tell us, tell us now! You want to drive don’t you? I penciled in my own Independent Thinker box, they were not amused. Neither was I. Interested in a Hot Rod? 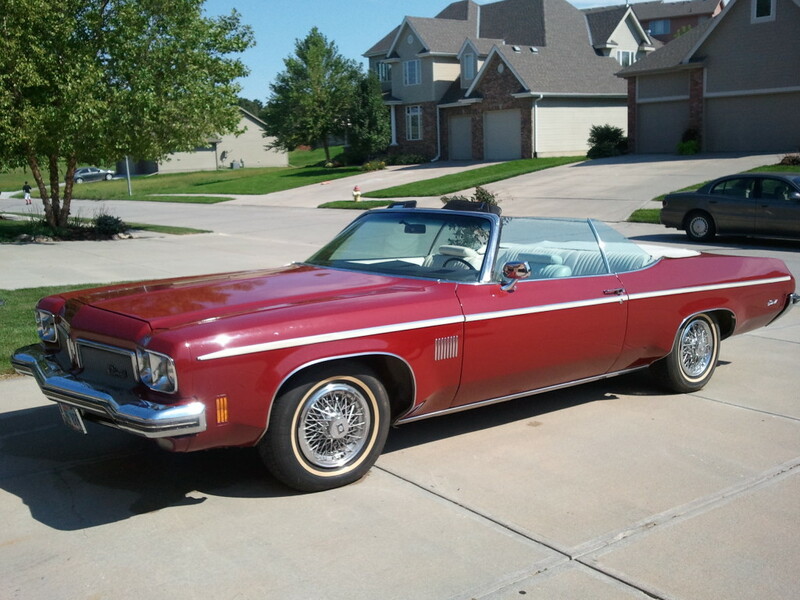 I’m putting my 1973 Olds Delta 88 Royale up for sale. 455 Rocket engine. 72K original miles. Always garaged. First $12,500 will be the envy of the Husker tailgate crowd. Training better be well on for everyone. If March 1st rolls around you’re at least 4 weeks in. We’ve had a couple of our “Debs” on the mend recently. Jay Welp took a very nasty spill on the ice and is just returning to regular running. Kevin Joerger nipped a stress reaction in the bud and is also back. Still time for that, thanks again to Stodden Physical Therapy. One of our presenting sponsors, he does what our mates need him to do and our mates do what he tells them to do. Nice. 1973 Delta 88 Royale. Almost entirely original, only 72K miles. Full power (windows, top). After market 8 Track. 455 Rocket Engine. Sweet. This entry was posted in Uncategorized on February 26, 2016 by runguru. Thought it would be fun to run my column from 4 years ago, consistency of message= principled philosophy. We’ve got our squad set for the Shamrock Shuffle- Adams, Schneider, Pohren, Thor, and Kern. And I’ve just accepted an invitation to return to Hospital Hill for their Team Challenge on June 2nd. Another big prize money opportunity, but the full menu of amenities are also a big draw. Housing, meals, etc., always a first class effort. Pohren, Thor, & Schneider + a couple more, top 3 score, and yep, we’re In It To Win It! 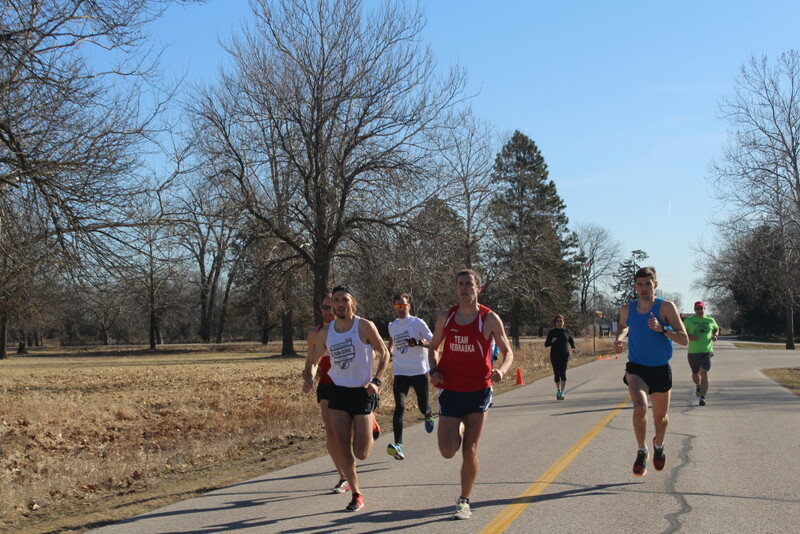 Speaking with the event yesterday I found out another USATF Nebraska Competitive Club will be racing the hills. I couldn’t be prouder of the Lincoln Running Company for fielding a team and sending them down to compete with the best of the best. Logan Watley is doing some Very Good work and I’m thankful that Team Nebraska is finally getting a chance to mix it up with someone other than ourselves for a change. They don’t have a big roster yet but those that are on board are serious about competing and we all welcome that. Most of you know that I wear another hat, I’m also the USATF Nebraska LDR Chair. Within that capacity it is my responsibility to encourage the formation of other LDR clubs, promote our USATF Nebraska Association Championship races, and advocate for competitions among those LDR clubs at said Championship races. First up of course is our 12K Trail Championships, hope to see All of our Nebraska LDR clubs representing. Incredible workout this morning. I anticipated it with some dread but now that its done I’m relieved and completely beat. Seventeen miles with 40 X pick ups of various distances and recoveries- all described but Top Secret. I’m looking forward to lunch and a nap. And I’ll not apologize for napping. This entry was posted in Uncategorized on February 25, 2016 by runguru. The Beastie Boys. I’ve got a few beasties lined out for this Saturday’s Halley’s Comet 8K. The final event in our underwhelming 2016 Two Rivers Winter Fitness Series. It’s been a good and easy series with Linda and I raising the bigtop and poop scooping afterwards, a two person circus. As with all good shows, you better have a good finish, you want to really wow them. Or as I’m crowing, “We’re going to burn that sucker down”, that sucker of course being the 8K course. My old buddy Hortense suggested Saturday may well be a portents. I softened it to simply a harbinger, the Spring of ’16. So who is going to “Make Some Noise?” Everyone hoping to be considered for their respective Shamrock Shuffle teams would be my first and most logical guess. Perfectly timed as a benchmark on who is legit fit. We’ve also extended a free entry to the entirety of our Nebraska Association LDR membership, another very good reason to come show your stuff. It will be exciting no matter. I’m familiar with the Chiller Challenge results of the last 15 years and feel pretty confident that a new Nebraska State Record will go down. As far as I can dig that seems to be the only other 8K in the state. 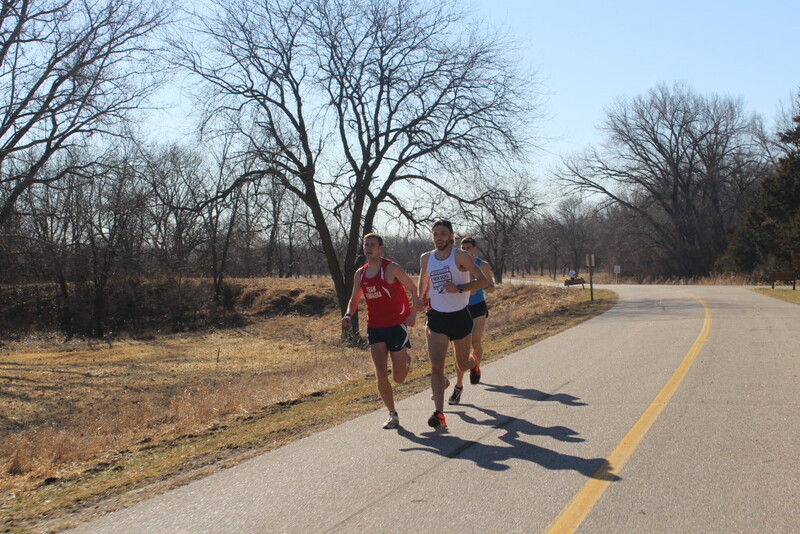 Grant Wintheiser (Nebraska Run Guru Elite, Inc) will be making his debut on Nebraska soil. Newly minted state 5K record holder Johnny Rutford (15:15- LRC Racing) should make it very interesting. Colin Morrissey and Cory Logsdon will be representing Team Nebraska. Both very fit and I appreciate their willingness to compete. Johnny’s mark set just two weeks ago could be in jeapordy. With that point being certified within the 8K I’ll have multiple watches capturing that split should a new record result from the depth of competition. I’ve got a few other invitations out that could make it the surprise race of the Spring. Saturday morning, 10:00, Two Rivers State Park. This entry was posted in Uncategorized on February 24, 2016 by runguru. Spring has sprung! And with it comes the kick off of Real Racing in 2016. Starting off with some of Nebraska Run Guru Elite’s ultra corps. Jeremy Morris took first overall at the Psyco Wyco 50K in 4:19:24. A leg cramping sufferfest over the last half of the course not enough to keep him from the top podium spot. Alli Moy-Borgen made her ultra debut a big success taking 3rd overall female. Nice coaching El Jefe! Jeff Gregg ran the Antelope Canyon 50 Mile through the famous Slot Canyons, finishing 17th out of 256 runners with a time of 9 hours. Giddyup! And the rest. Ivan Marsh made it 10 in a row at Trek to the Top. Morgan Chaffin took the women’s title. Al Sanabria ran a season best 14:43 5000 indoors. Ever so briefly held a Willie’s Golden Ticket, he’s trying to make the Costa Rican Olympic team and will no doubt fill his dream. The 10th annual Ni-Bthaska-Ke 12K has just signed an old friend. Olympic Trials Marathoner with a 2:13 personal best. My old buddy Patrick Rizzo. Betting window is now open! This entry was posted in Uncategorized on February 22, 2016 by runguru. Some good work going on behind the scenes over at USATF Nebraska Association LDR HQ. Logan Watley is setting up an archives of our past association championships. While it will only be an asterisk on an overcrowded association website, it will be my favorite page. Researching my files. The genesis of our association champs, 2005-2012, reminisces of my first efforts to provide focus on elite athletics in Nebraska. I’ve submitted 18 race results and have to dig up a few more yet. Within those results, the essence of my vision, what I founded the LDR Program on. My tenure as LDR Chair. Excellence. Long standing and now serving as benchmarks. For Nebraska Run Guru Elite, and at least that young fella named Rutford for LRC Racing. The gems, the Road Records. All on USATF Certified Courses in a time when those efforts were a hard sell. All awarded prize money that was very hard fought for. Excepting last Sunday’s 5K in which Johnny Rutford, after some help from Colin Morrissey, was a dig down and get after it like I haven’t seen in way too long. Hope lies in our youth. Fellas, Ladies, here are some marks you ought be chasing this year! Note here, and speaking only of my tenure, the Lincoln Marathon also hosted our USATF Champs from 2004-2012, dedicated prize money to USATF membership. In the earliest days, there was money earmarked for USATF Clubs as well as individuals. An effort to stimulate more clubs, a vision too far ahead of its time. My former mates always swept so it was rolled into the individual purses making for nice paydays either way. The Lincoln Marathon, a whole chapter due their vision and generosity! This entry was posted in Uncategorized on February 19, 2016 by runguru. Breaking news out of Hades! Ice crystals have begun to appear out of nowhere. What has brought about the seismic shift in the fabric of time, space, and all we believe to be true? I’m considering legitimate employment. Responded to an ad and got a return call. During that preliminary introduction I owned up to my style and principles and initial terms. Hopefully the vetting process will be deep. My style and principles. Fabrics woven into this daily blog for over 10 years. Starting and ending with freedom of speech. Unwavering calls for honesty. Celebrating excellence. Describing mental toughness- The Mind Is The Athlete. Reporting on the running community. A microcosm of the Real World. Keeping arrow true to my heart. Insight and Incite the result. And Progress. Moving mountains with words. Shaping a landscape to foster long term athlete development. Noble goals hard won over a decade. Every tilt, each challenge, the blows and defeats, the soaring victories. Part of our story as I’ve recorded it. I’m a writer. Poetic license granted by virtue of profession. Certain embellishments, thinly or thickly veiled, messages, FYIs. Regular readers, you know my style. And Principles. This entry was posted in Uncategorized on February 18, 2016 by runguru. I give today’s inches to my old buddy Pat Rizzo. His opinion is the one that counts. I’m pissed because I saw two of my former WLDR Executive Committee colleagues hanging out at the finish line. What powers swept them out of their responsibilities to the athletes? I hope they didn’t go down without a fight. I know I would not have! “I have been hesitant to post my feedback for the LA organizing committee as some of those people are people I consider friends. I respect their work and the amount of time that goes into creating a championship experience for elite athletes. I also don’t like to be overly negative in my assessments. Sorry ahead of time if anyone construes this as whining or angry; it’s entirely based on 10 years of post-college racing experience and comparison to the previous two Olympic trials I’ve run. From three months out I was asking my agent when we needed to be in LA. It was already time to start looking into hotels and flights and we didn’t even get information on the date and time of the tech meeting that is mandatory attendance. That correspondence didn’t get delivered to athletes or agents until 11 days before the race, with all deadlines mentioned (hotel, travel submission, etc.) already past. Even then the communications were vague. Fluid declarations were closed before the qualifying window was over. I’m still VERY confused how you can close the window for declaring intent to use personal fluids on January 13 and still have people qualifying on January 17. Did USATF or the LA committee even think about this? Fast forward to arrival in LA and “B” athletes staying at the hotel ($300+ per night, three night minimum) would have to pay $15 a person, each way, for a ride to and from the airport to the hotel. I’ve been fortunate enough to compete in three Olympic trials and have never witnessed something so nickel-and-diming unprofessional. Either offer the shuttle for the athletes or don’t but to charge them for it after you selected such an expensive hotel is an insult to injury. The hospitality suite was the most spartan setup I’ve ever seen in a hospitality at a race. I’ve been to 5k packet pickups that had more amenities. All that was in the suite (aside from USOC uniform check tables) was water, sparkling water, and Powerade. There were no snacks for people traveling into town, no meals provided, nothing that is actually very standard for races, let alone races of this caliber. 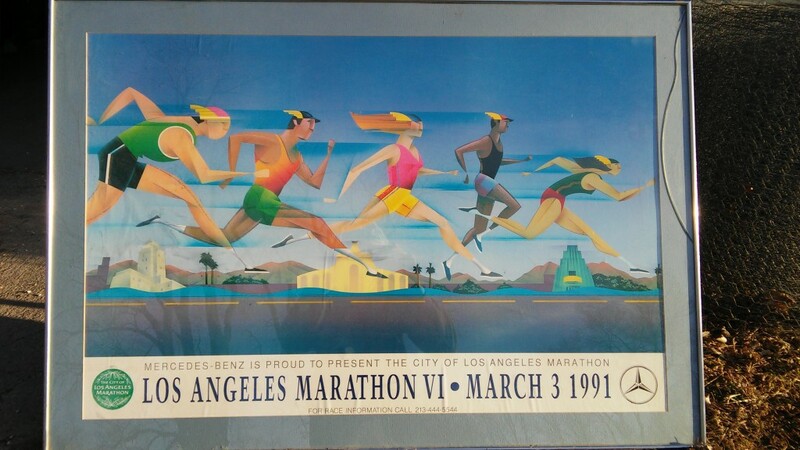 I would be willing to bet that the Skechers LA Marathon suite even included snacks and hospitality! We were asked to bring only bottles that included NO commercial advertizements for our personal fluids in order to be compliant with IOC Rule 50. After watching many athletes scrambling to be compliant with tape or bringing whatever they could find, we were provided with bottles that displayed “COKE” in about a 50 square cm size (non-compliant by governing rules). I was also forbidden from filing an appeal for rule violation on that account. I have the appeal still in my backpack, should someone want to see it. The race occurred under “red flag” conditions. That indicates that conditions are extreme but the competition may go on, though requiring additional safety precautions by both organizers and participants. It was mentioned that a neutral aid station of water and Powerade would be added to the north end of the course. No such aid station was added. It was 5k-7k between aid stations that occurred with personal fluids directly followed by neutral fluids. For safety alone the organizers should have added neutral fluids near USC campus. *Also note for the record, USC’s campus smelled like an uncleaned zoo. Continuing the race, IF you were fortunate enough to finish, the finish line was indistinguishable. Jared Ward wasn’t the only one who was confused to where the finish line really was. We crossed the finish area 5 times and I still couldn’t recognize it because the posts were so far outside the course and there was not an overhead structure. As we got through the finish area, we were handed a bottle of water and pushed back into the tent. Little did we know that this would be the last we see water until we get to a hotel! There was no water, Powerade, or food of any form in the finish area for athletes. There WAS, however, a catered, cooled tent for VIPs that athletes could be rudely kicked out of while USATF and USOC bigwigs wined and dined in our misery. Even a third rate race of 50 people has at least bananas and water cups accessible after the race. We weren’t extended such a courtesy. We were given our warm up gear back and promptly pushed out of the anti-climatic finish area like cattle for slaughter. It has also been reported that the runner tracking went down at about halfway through the race. Even local, low-budget races can get reliable runner tracking. How have we fallen so short in an Olympic trials race? Was this what we were supposed to be showcasing for the LA2024 bid? All-in-all I have never felt so slighted at a championship race, or any race, in my 10 years of racing post-college. Los Angeles had a chance to really shine, outdo every criticism we may have had of the LOC leading into the race. They could have put on their big city pants and make big things happen. Instead we were the red-headed stepchildren of the weekend. It felt like we were a burden on them all weekend instead of being the show people wanted to see. After all of that we didn’t even get a tee-shirt for qualifying and running in the Olympic trials. This entry was posted in Uncategorized on February 17, 2016 by runguru. It really is. You have to be hardened off once in a while. Because life is difficult. No big deal really but I felt a pang of loss this morning when I found almost 20 of my young Cornish Rock broilers dead as a door nail. Only a week old, despite plenty of space, inexplicably smashed together, I’ll spare you the rest of details. Life ain’t fair folks. And life is fair folks. The pendulum do swing- its arc tracing both sides. Its how you handle that duality, reconciling curse and luck that defines your character. The best thing is to enjoy your fortunes and learn from your losses. Finding that peaceful acceptance. Understanding karma. The Middle Path. Understanding that life truly is a journey, with inspiring and defeating moments all playing important parts. The bigger the loss, the more profound the lessons. The larger the inspiration, the more you learn to appreciate. At least it ought be that way. And who wants to go through life with nothing but butterfly kisses and rainbows and unicorns anyway? Give me the jungle and all it has to teach about living a full life. Keep me centered. Let me absorb the extremes with dignity and understanding. That’s living. This entry was posted in Uncategorized on February 16, 2016 by runguru.